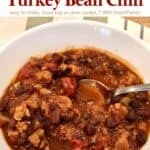 This recipe caught my eye because my husband loves chili, and it wasn’t like most typical chili recipes. It included two ingredients I’ve never put in chili, cocoa powder and molasses. I was intrigued and couldn’t wait to give it a try. Turns out these provided a depth of flavor that can’t be beat! I had most of the ingredients on hand, with two substitutions. 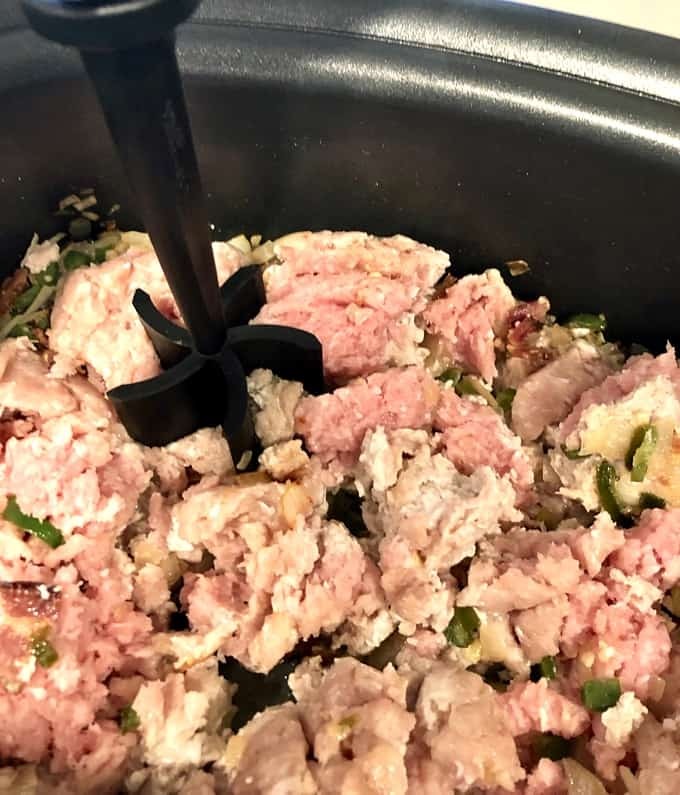 I replaced the ground turkey with lean ground pork. And I didn’t have canned pinto beans, so I cooked dry small red beans to use instead. I find the easiest way to cook dry beans is overnight in the crockpot. I just rinse the beans, add them to the crockpot, and add enough water to cover the beans by 2-3 inches. Cook on LOW for 8 hours. In the morning the beans are done and you simply salt to taste. We all loved it. 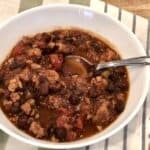 This will be my “go to” chili recipe from now on because of the lighter tomato flavor and depth of flavor provided by the molasses and cocoa powder. Heavy tomato sauce can often be too acidic for me to really enjoy. Add bacon to dutch oven, or multi-cooker (I used my Ninja 3-in-1 Cooking System (affiliate link)), and cook on medium until crisp-tender, 6 to 8 minutes or so. Add chili powder, cocoa, and cumin. Stir for 1-2 minutes. Break up tomatoes with your hands and add along with remaining puree from the tomatoes to the pot. Reduce heat to simmer and cook covered for 15 minutes. 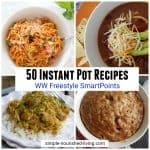 This recipe also can be done in a slow cooker. Just brown the meat and vegetables on the stove top and then add along with remaining ingredients to your slow cooker, cover and cook on LOW for 4 hours or so. If using a multi-cooker, use stove top setting until meat is browned; then add remaining ingredients and set to slow cook on LOW for 4 hours. Substitute any ground meat for the the turkey. Lean ground beef, ground chicken, ground pork, turkey sausage, etc. Substitute any type of beans for the pinto beans. A combination of beans would be nice too. 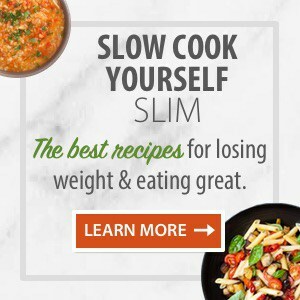 Use the Mix N Chop (affiliate link) by Pampered Chef to break up ground meat easily. 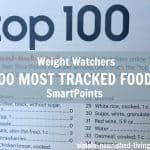 Make this vegetarian by substituting vegetarian crumbles for the meat and/or bulking it up with more beans and additional vegetables. 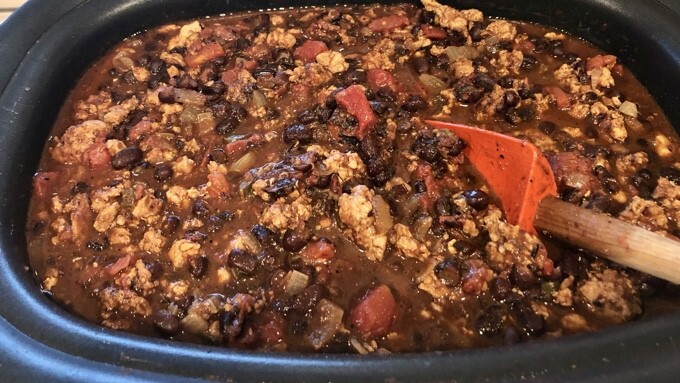 This recipe makes a large quantity of chili, perfect for parties or portioning out and freezing for future quick and easy meals. 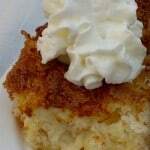 You could also easily divide all the ingredients in half to make a half batch. Top chili bowls with cheese, pickled jalapeños or cilantro. 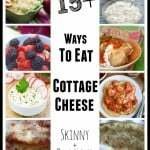 Serve with crackers, tortilla chips, or a cheese quesadilla. Serve over brown, white, or cauliflower rice. Serve on a bed of greens for a light taco-like salad. Turn your leftover chili into a soup by adding chicken broth, a can of corn and fresh cilantro. Make nachos with all your favorite toppings. Make stuffed potato skins for a tasty appetizer. Toss with elbow macaroni, put in 8-inch pan, top with low-fat cheese and bake for an easy Tex Mex Chili-Mac Casserole. 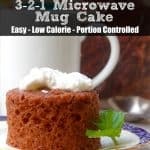 Make a warm dip by stirring chili into melted low-fat cream cheese. Top a baked potato with warmed up chili and sprinkle with shredded cheese. Freeze some chili to enjoy later. 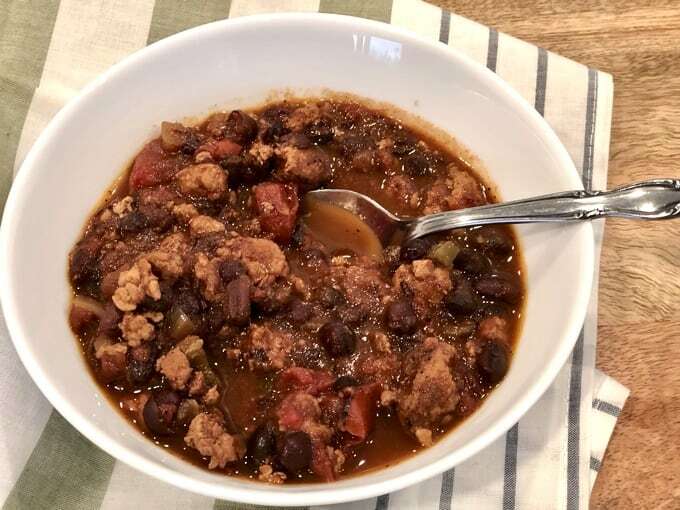 If you’ve made this Ground Turkey & Bean Tex-Mex Chili, please give the recipe a star rating below and leave a comment letting me know how you liked it. And stay in touch on Pinterest, Facebook, Instagram and Twitter for the latest updates. The Tex-Mex winning combination of chili, chocolate and cumin won't disappoint. Light yet flavorful, this recipe makes enough for a crowd. 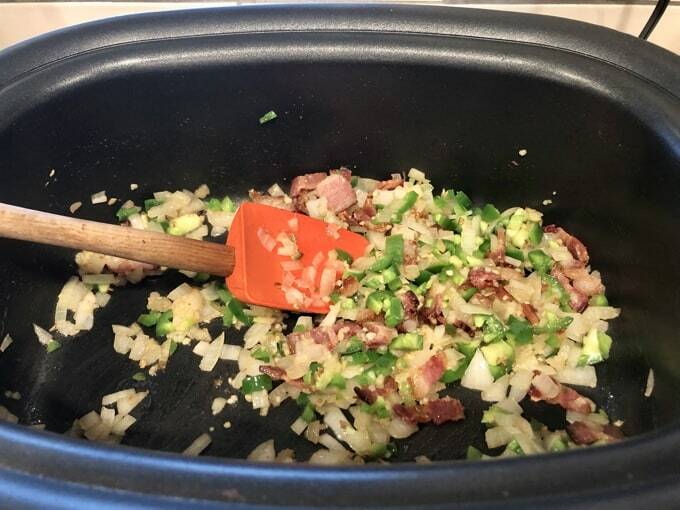 Add bacon to dutch oven, or multi-cooker, and cook on medium 6-8 minutes, until crisp. Add onions, garlic and jalapeños. Stirring frequently until softened (about 5 minutes). Add turkey and break up the meat. Cook until browned (about 10 minutes). Break up tomatoes with your hands and add along with remaining puree fro the cans to the pot. Add molasses, water, and salt. Reduce heat to simmer and cook covered for 15 minutes. Add beans. Continue cooking uncovered for 30-45 minutes. 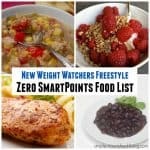 This recipe can also be cooked in a slow cooker. If using a multi-cooker, use stove top setting until meat is browned; then add remaining ingredients and set to slow cook on LOW for 4 hours. 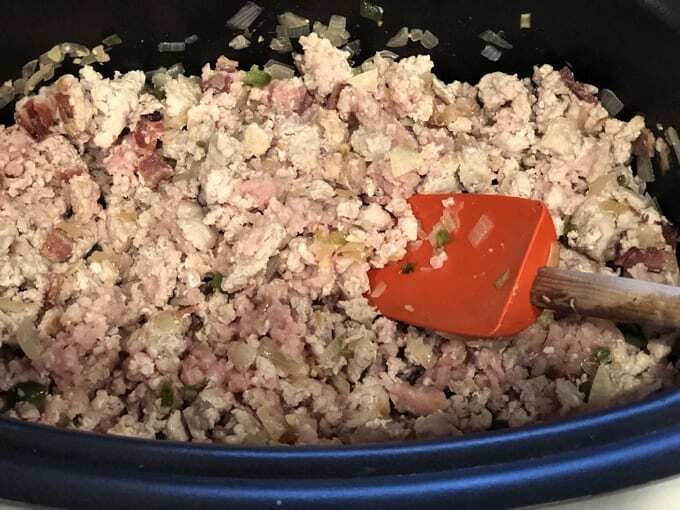 Substitute any ground meat for the the turkey. Substitute any type of beans for the pinto beans. Use the Mix N Chop by Pampered Chef to break up ground meat easily. Bulk it up with veggies instead of meat to make it vegetarian.